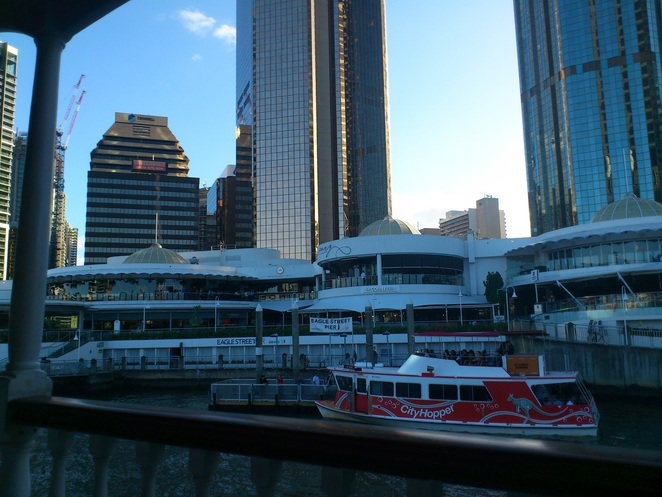 The sun was glistening on the river, the sounds of a Dixieland jazz band wafted towards us and a light breeze was caressing the happy crowds along the City Reach Boardwalk as we made our leisurely way towards our destination - Eagle Street Pier. It just doesn't get any better than Brisbane by the river on a perfect autumn day. That is, unless you add a high tea cruise aboard the Kookaburra Queen into the already sublime mix. And that's precisely what my daughter and I did last weekend. Paddle steamers and Brisbane River may not seem like an obvious combination (unlike the mighty Mississippi or Murray rivers, which have long histories of paddle steamers plying their waters), but the Kookaburra Queens are a Brisbane legend. 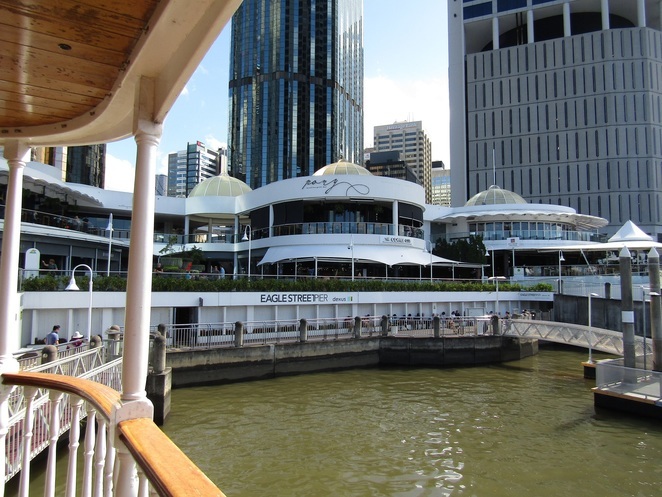 Built in 1988 for the event that really put Brisbane on the map as a destination - the fondly remembered World Expo 88 - the Kookaburra Queens were constructed entirely of Queensland timbers by local shipwrights, and have been a popular venue for weddings, dinners and lunches on the river ever since. 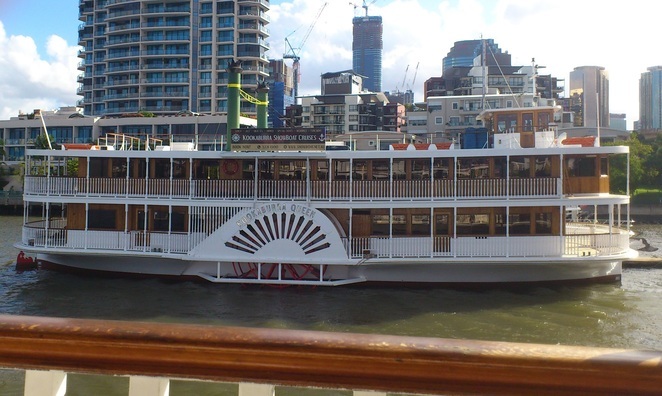 The vessel for our trip was the Kookaburra Queen II. Image courtesy of Alexandra Massey. We checked-in at the Eagle Street Pier office and spent our short wait until boarding at noon watching the happy throngs of passersby, taking in the not-quite-ocean scent of the river, and being serenaded by the aforementioned jazz band, complete with banjo, clarinet and tuba, who performed on the mid-deck until the boat embarked on its afternoon journey. 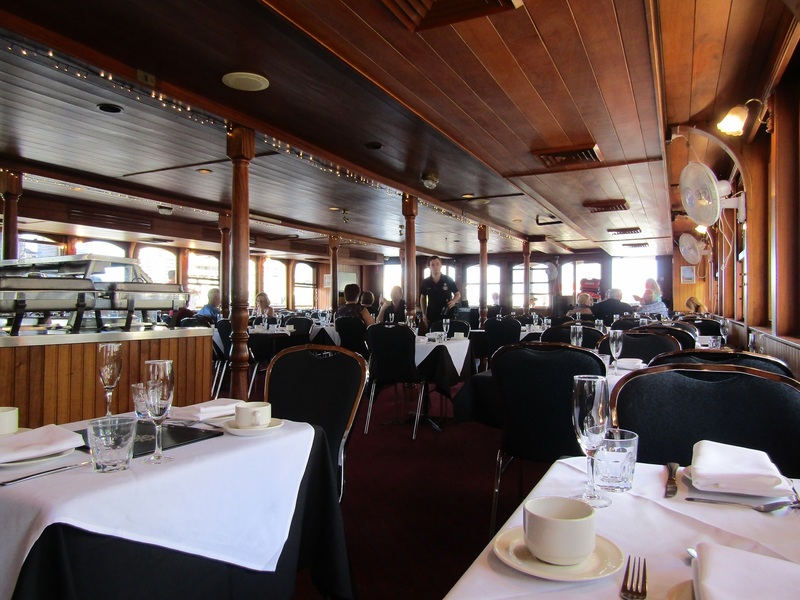 On boarding we were shown to our table for two by the window on the starboard side. 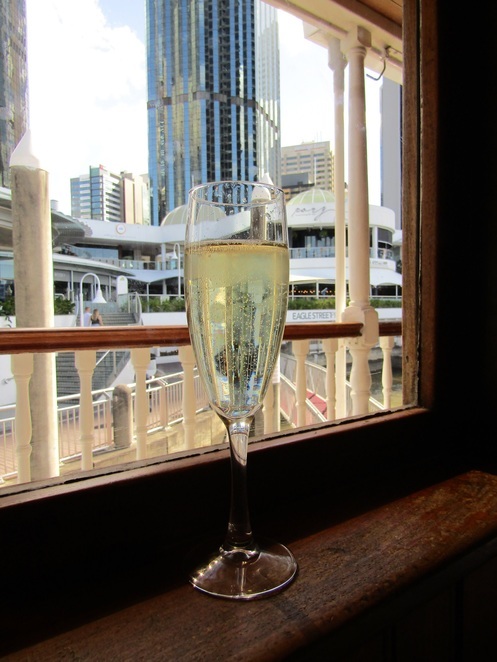 We sipped on a glass of bubbles while other passengers streamed aboard - a variety of couples, families, singles, and girls' day out parties. Tea, coffee, soft drink, bubbles, selected beers, and happy conversations flowed around us as numbers swelled. We departed Eagle Street Pier at 1pm and headed off up river, deciding to do a bit of exploring before high tea was served. 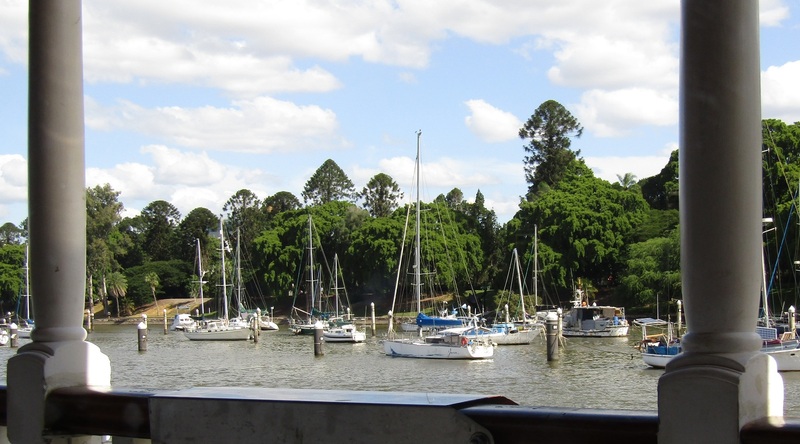 We wandered up and down the timber-panelled decks while we drifted at a leisurely pace past the gorgeously green Botanic Gardens and the bobbing yachts that call this stretch of the river home. 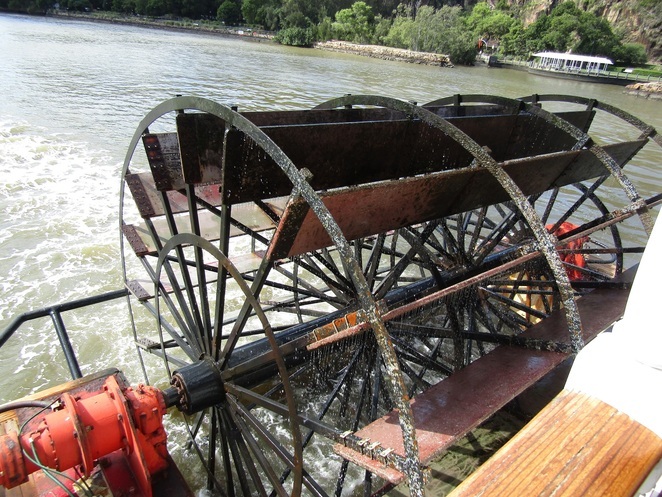 As we travelled past Riverlife and the towering Kangaroo Point cliffs the usually brown Brisbane River was shimmering silver and the huge paddlewheel whirred and spun, each wide paddle throwing sparkling drops high into the air. We returned to our seats and found Pete, our entertainer and MC for the trip, up the front at the microphone. His amusing line of patter and presentation of easy listening tunes and old standards was a real treat, providing a fun soundtrack throughout the afternoon. 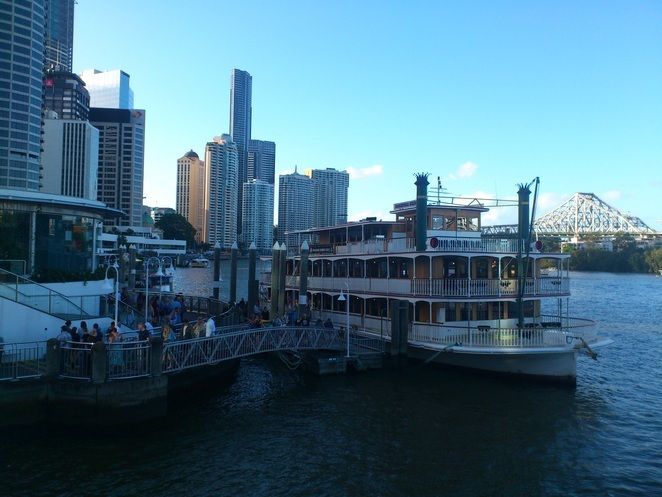 Under the Captain Cook and Goodwill bridges and past the Queensland Maritime Museum and sturdy steam tugboat, the SS Forceful, we continued towards South Bank, where hordes of people were out and about enjoying the magic Brisbane day, but probably not as much as we were. 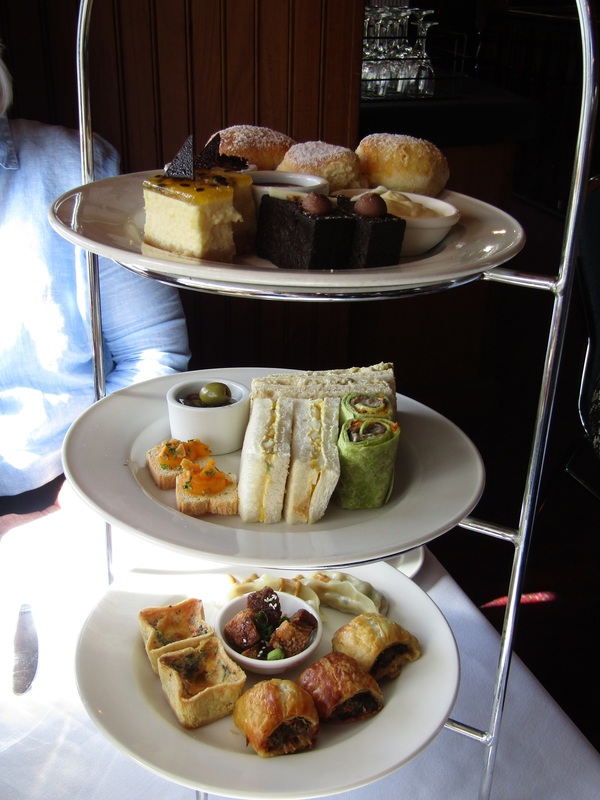 Our high tea was served as we ducked beneath the heritage-listed William Jolly Bridge: three tiers of delicious finger food on white china plates. The bottom tier was hot food, consisting of mini quiches, sausage rolls, dumplings and crispy pork belly. The middle tier held finger sandwiches, wraps, pumpkin mousse on croutons and olives, while the top tier was adorned with sweet treats: fluffy scones with jam and cream, chocolate mousse, cheesecake and rich chocolate mud cake. Never ones to shirk a challenge we began at the bottom and slowly worked our way to the top, all the while enjoying the passing scenery and light autumn breezes. 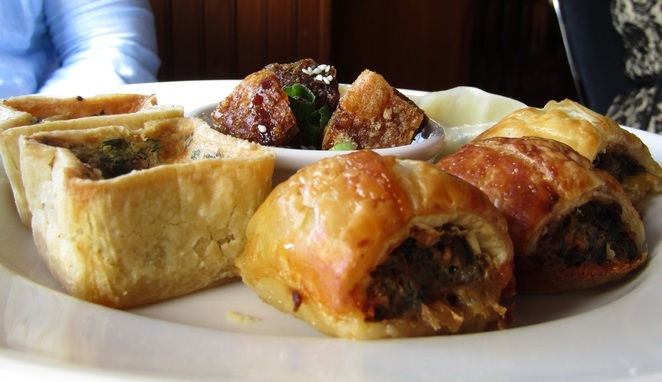 The food was very good, with the crispy pork belly, wraps, cheesecake and scones the standouts. 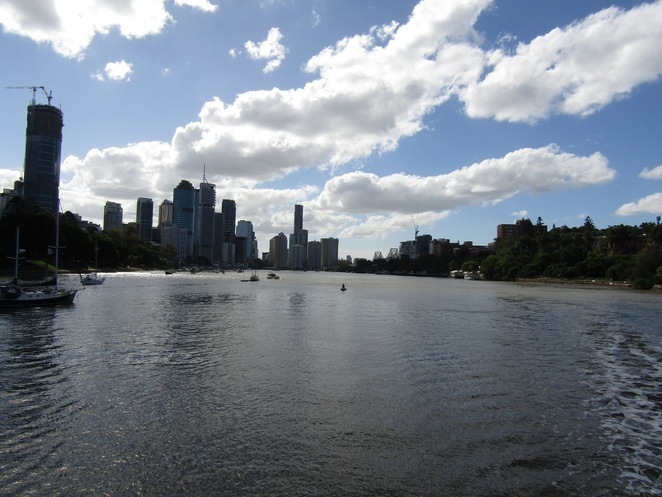 We swung around at Toowong Reach, heading back down river and sweeping past a procession of Brisbane riverbank landmarks as the bubbles kept coming and the shadows lengthened over the city. 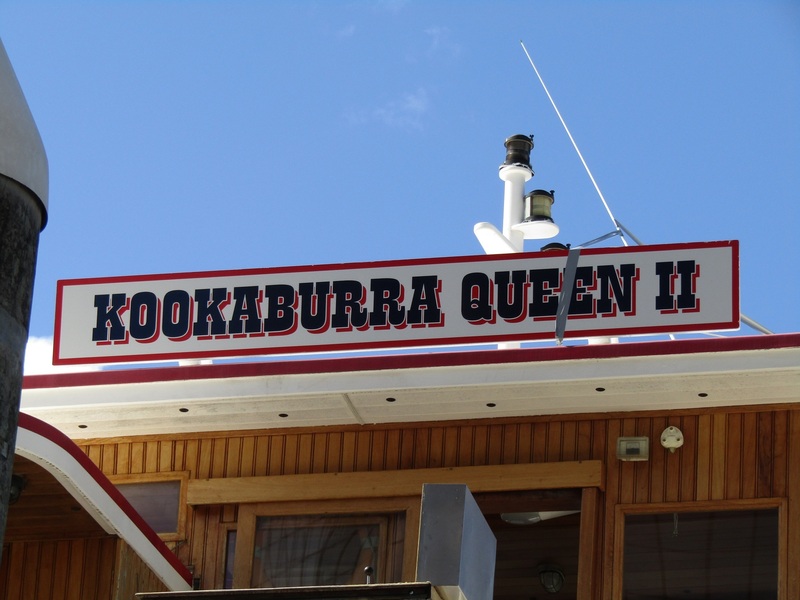 We passed by the first lady of the Brisbane River, Kookaburra Queen I in all her glory, having just returned from an extensive renovation. Gas stripping tower, West End. Image courtesy of Alexandra Massey. Our tour continued back past our starting point and the copper-domed Customs House. 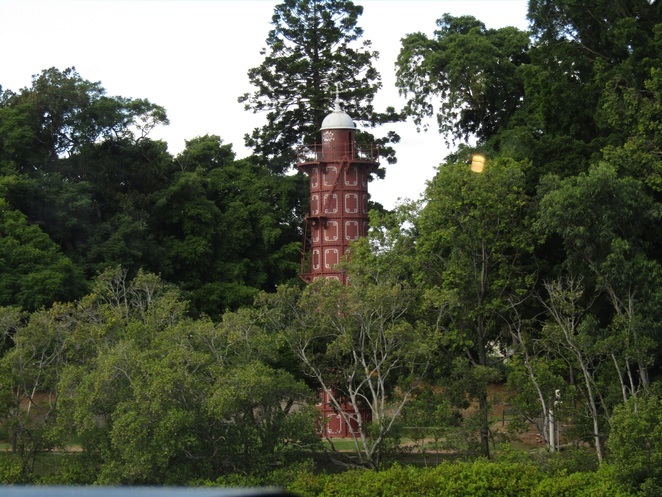 The vista of Brisbane city, the windows of its tall towers glinting in the sunlight, spread before us on one side while on the other, the trees and grass of Captain Burke Park looked inviting. 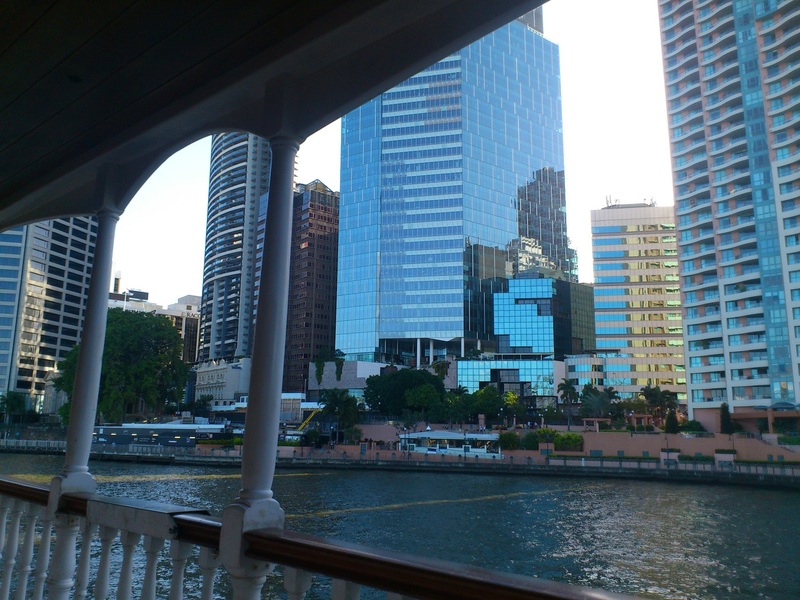 As we glided slowly under Story Bridge (my favourite Brisbane bridge) it was hard not to reflect on the beauty of our river city. 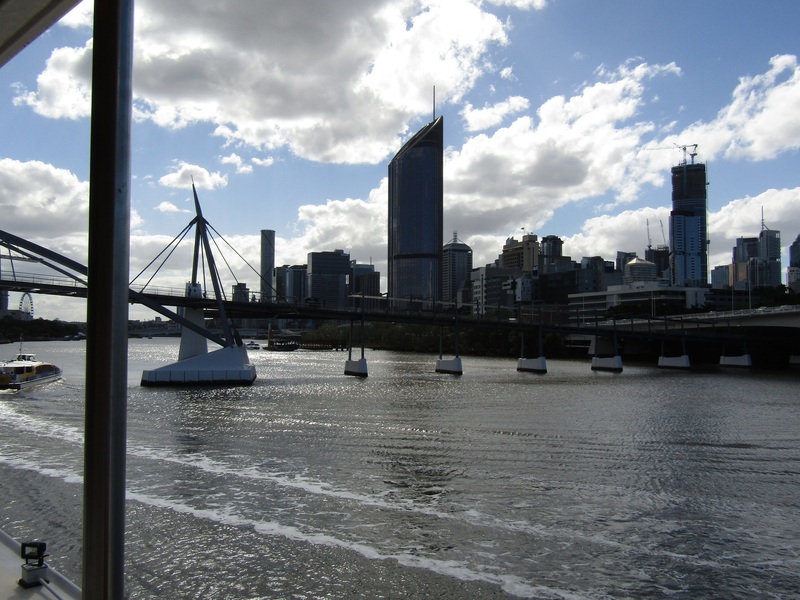 From our floating vantage point, we could really appreciate its architecture, striking riverside public spaces, and even the often-maligned sinuous brown river itself. I don't care what anyone says, I think it's beautiful. We puttered along for a little longer and then at Norman Park reluctantly turned for home. 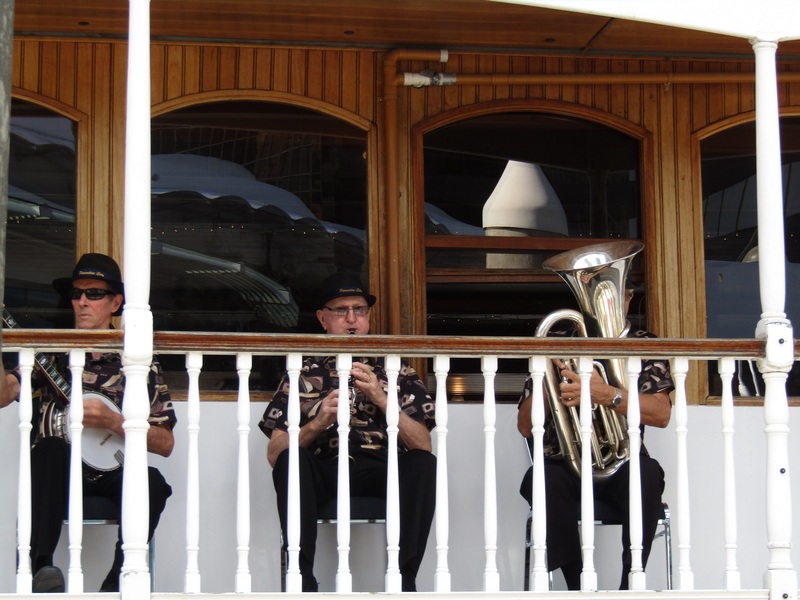 On our return to Eagle Street Pier, we were greeted once again by the jazz band, which played while everyone disembarked. It was a lovely final touch to a perfect afternoon on the river. I'm calling it. 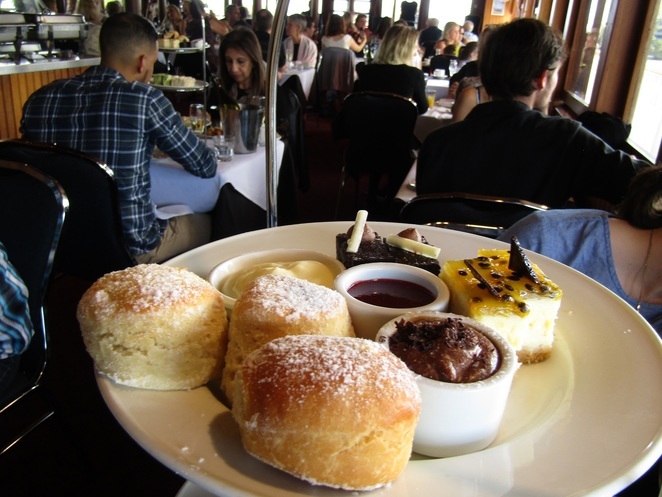 A High Tea Cruise on the Kookaburra Queen has to be Brisbane's best value high tea. 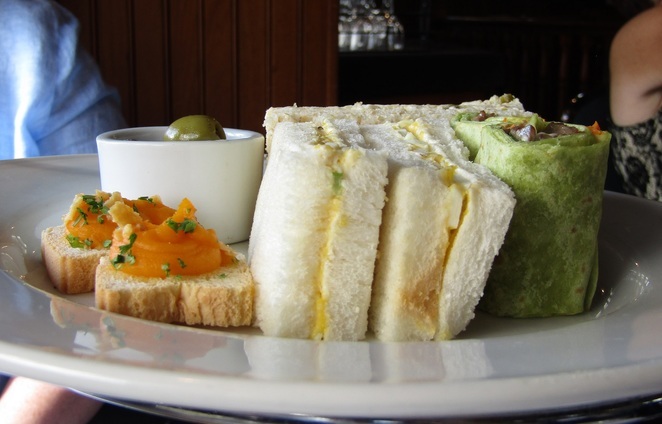 Where else can you get a high tea that includes delicious food, live entertainment, great service and bottomless (yes, bottomless!) tea, coffee, soft drink, bubbles, and selected beers? And the price is only $49 for adults, $39 for concession holders and $20 for children aged 4 to 12. You may get something more sophisticated, or with real (and expensive) champagne elsewhere, but you will definitely pay for it. 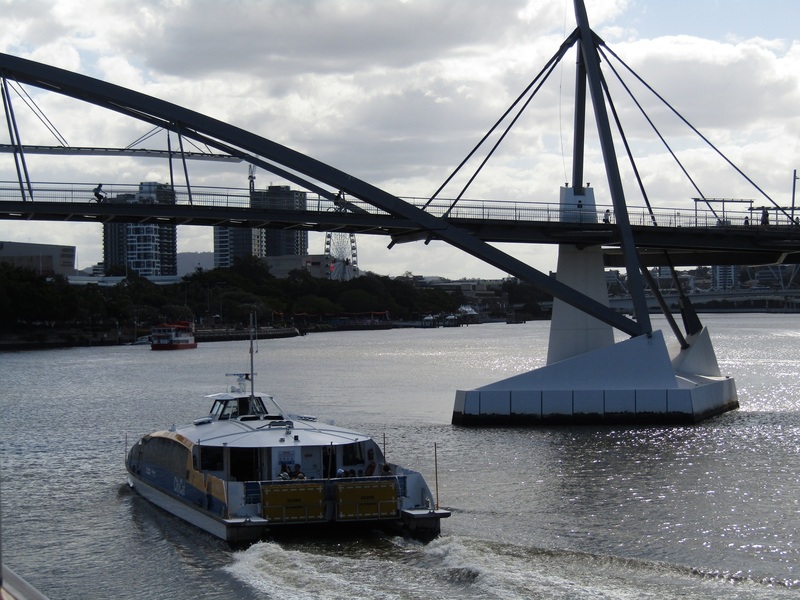 And you won't be cruising the Brisbane River while you enjoy it. The cruise runs on Saturdays and Sundays with boarding at 12 noon, departing at 1pm and returning at 3.30pm. As Molly Meldrum would say, do yourself a favour. Book yourself a front row seat to the very best that Brisbane has to offer: great food, friendly staff, a ride aboard the grand old lady of the river, and Brisbane River up close and personal. Brisbane, it doesn't get any better than this. When: Saturday and Sunday afternoons from 1pm to 3.30pm. Boarding from 12 noon. Geraldine, lucky you. It looks and sounds terrific.